Browse: Home / 2019 / January / 16 / 700,000 Square Kilometers Of Added Green Vegetation, Climate Change Shrinks Sahara Desert By Whopping 8%! This is worse than we thought. A pristine desert ecosystem is being destroyed by invasive plants, caused by climate change. Oh, come on B&t. What’s the worst that could happen? Greening is occurring not just in arid regions, but across the globe…even in the tropics. Even NASA admits it, though they try hard to downplay the role of CO2, and still say that the increased CO2 isn’t good. But still, they are forced to admit the world is greening. Even when the facts are screaming in their faces and proving them wrong, they refuse to accept that they are wrong. Yonason, may I interest you in [placeholder*]. It will make you feel good in the short time but has devastating effects in the long term. Do you see how both effects are possible? Your logic is deeply flawed. What “logic?” I’m stating facts. Logic does NOT trump reality. And the reality is that CO2 is good for the planet. There is no down side. Now, if you know of PROOF (data and fact based, not theoretical or logically deduced from flawed assumptions) that CO2 is harmful, then by all means, present it. PS – your analogies are not getting any better. Also, thank you for proving that you can’t deal with the reality, but always have to try to redirect to some absurd warmist paranoid fantasy. NASA “admitting” to the benefits of CO2 but simultanously warning from more CO2 somehow makes them wrong in your view. And the reality is that CO2 is good for the planet. There is no down side. Proof? CO2 is a greenhouse gas and thus influence the energy budget. It also gets absorbed by sea water. You somehow believe this is not the case or not a problem. Do you really think this is not “data and fact based” and just an assumption? What kind of reality distortion field does that to a person? Normally people react positively when you give them an analogy that they might be more familiar with where similar principles apply. You guys seem to shut down all brain functions when the word climate isn’t included somewhere and need to pepper it with some insults. The only absurd fatansies here are yours, Yonason. And I suspect you know that deep down … no way someone like you can be serious. Poor delusional anti-science SebH thinks that just because NASA makes an unsubstantiated assertion that CO2 will cause warming AND that that warming will be harmful, when neither has ever been true in the past, that’s sufficient. It’s not. Never has been, never will be. Just because that’s the world you live in doesn’t mean the rest of us have anything to do with it. And it’s still a crummy analogy. Atmospheric CO2 at (almost) any concentration experienced on earth does NOT cause harm. It’s not a poison. It’s not a drug. It is an essential compound, without a minimum of which (to which we were perilously close at 180 ppm) all life WILL die. 1. – That statement is “proof” of nothing, except that you haven’t a clue what constitutes a proof. The influence CO2 has on climate isn’t measurable, and REASONABLE calculations show it to be a bit player, a minnow in the ocean, while the manatee in the goldfish bowl is water vapor. Great explanation of that and a lot more is here, though I doubt you will understand any of it. 2. – Your accusation that I don’t believe CO2 plays any role, and that I don’t believe that CO2 is absorbed in the ocean, when I’ve written in the past that 90% to 95% of all CO2 is contained in the ocean, are both bald faced LIES! You just can’t help yourself, can you! You ALWAYS have to misrepresent what others say, or have said. As to CO2 being a problem, you provide no reason why anyone should believe that it is, and ignore the massive evidence (see links provided for some of it) that there is NO problem. It is NOT a matter of “belief,” but of reliance on evidence. You provide none for your assertions, ever. How else to say this… When we ask for “proof” we do NOT mean mere statements to the contrary of what we say, but actual data, or reliable reports based on actual data, not “adjusted” to fit a preconceived bias. We don’t mind if you disagree with us, just start supporting your claims with real evidence, not he-said she-said silliness. Stop using analogies. They only show how inept you are at generating them. And above all, stop lying about what we say! It is a very ill wind that blows nobody any good! I’m afraid your title is wrong. The Venter paper you refer to does not even study the Sahara desert. 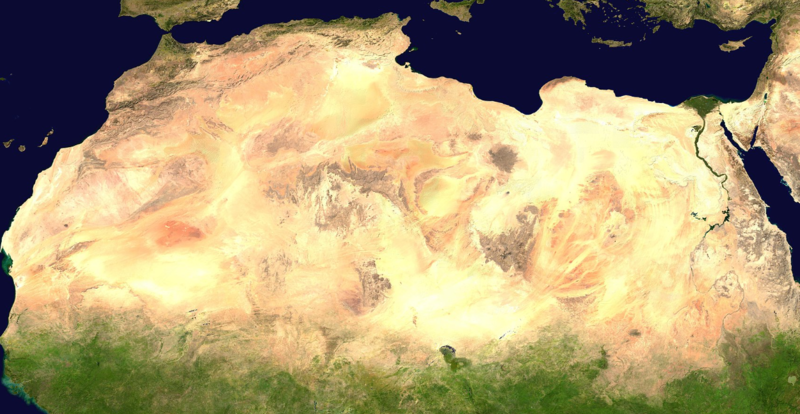 The paper instead talks about increased leaf cover in the non-desert area SOUTH of the Sahara. The southern edge of the Sahara (extending through Mali, Chad, Sudan) does indeed indicate there has been some modest greening in the southern Sahara itself according to Figure 1, right. However, the vast majority of the greening occurs in the central and south-central regions of the continent which are quite a ways disconnected from the Sahara, and hence the 8% reduction in the size of the Sahara Desert itself is not supported by what’s shown in the satellite image/figure. Suggested new title: 700,000 Square Kilometers Of Added Green Vegetation In Sub-Saharan Africa – An 8% Brown-To-Green Change! Good, just wanted to comment about the clickbaity headline that is not supported anywhere. Interesting, Kenneth, how when we fix errors we’re mocked by the trolls, as if our errors that we fix somehow justify the endless errors they make but NEVER correct. Point out the error of a skeptic, and he’ll thank you and fix it. And with all the abuse you’ve taken, Kenneth, for their seemingly endless errors that you draw to their attention, you know that better than any of us. Thanks again for all the ways that you expose them. By definition science is a self-corrective force. That’s why it surprises me that you guys come up with posts/comments that basically say “but in 19xx science predicted this and that and it didn’t happen” as if nothing has changed from back then in the meantime. That doesn’t happen. The usual reply is that I should present evidence or something and “that we can’t know” or a list of papers that the skeptic interpreted in a way to support his/her claim. Or often just a “well, what if the author is on to something” or the usual “if true, then XY” clause. I don’t know what you mean by post-modern leftist, but I assume you see yourself as the opposite of that. So what makes you think that you aren’t moking your opponents, aren’t doubling down on your errors and don’t say that your opponent has no clue? Do you even read what you write when you reply to people like me? “Science” is not a force of nature, it is a rigorous discipline practiced by humans in order to understand nature to the best of our ability. At least, that’s when it is practiced correctly. BUT, when perverted for political and personal gain, it can no longer be trusted. Once hijacked by knaves, it becomes a self-degrading force, not just for itself but for all who rely on the benefits we used to expect from it. Thank you for YET AGAIN demonstrating all too clearly that, you haven’t a clue “what science is.” 😉 yourself, troll! From France with love !